Visualization of the three knockout-phase matches of the Spanish team. (PhysOrg.com) -- As a young boy growing up in Portugal, Luis Amaral loved playing, watching and talking soccer. Amaral and his friends passionately debated about which players were "the best." But, it was just a matter of opinion. Unlike baseball and basketball, there isn't a lot of statistical information detailing how each soccer player contributes to a match. Amaral, now a professor at Northwestern University, combined his love of soccer with his research team's computational skills to measure and rank the success of soccer players based on an objective measure of performance instead of opinion. The results of the study will be published June 16, 2010 PLoS ONE, a journal published by the Public Library of Science. Though their analysis, Amaral and his team were able to objectively rank the performances of all the players in the 2008 European Cup tournament. Their results closely matched the general consensus of sports reporters who covered the matches as well as the team of experts, coaches and managers that subjectively chose players for the "best of" tournament teams. "In soccer there are relatively few big things that can be counted," said Amaral, professor of chemical and biological engineering with the McCormick School of Engineering and Applied Science and senior author of the paper. "You can count how many goals someone scores, but if a player scores two goals in a match, that's amazing. You can really only divide two or three goals or two or three assists among, potentially, eleven players. Most of the players will have nothing to quantify their performance at the end of the match." To find a quantitative way to rank players, co-author and Northwestern graduate student Josh Waitzman first wrote software to pull play-by-play statistical information from the 2008 Euro Cup website. This type of extensive statistical information is usually only gathered for important matches, Amaral said. 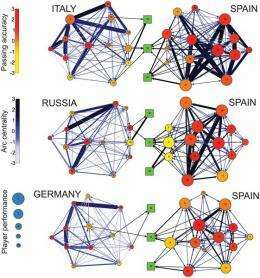 Amaral and Jordi Duch, the paper's first author and an assistant professor of applied math and computer science at Universitat Rovira I Virgili in Spain, used the data to quantify the performance of players by generalizing methods from social network analysis. Amaral's team mapped out the flow of the soccer ball between players in the network as well as shooting information and analyzed the results. "We looked at the way in which the ball can travel and finish on a shot," said Amaral, who also is a member of the Northwestern Institute on Complex Systems (NICO) and an Early Career Scientist with the Howard Hughes Medical Institute. "The more ways a team has for a ball to travel and finish on a shot, the better that team is. And, the more times the ball goes through a given player to finish in a shot, the better that player performed." "It would never happen by chance that we would get such striking agreement with the consensus opinion of so many experts if our measure wasn't good," Amaral said. He says this kind of analysis can be used outside of the soccer world, too. Companies could use the method to rank and evaluate the performance of employees working together on a team project, for example. It seems the results could still be influenced by opinion. If player A has control of the ball and wants to pass to B or C, all things being equal, wouldn't he pass to the better player? If everybody thinks player B is the best player on the team, wouldn't part of the team's strategy be to utilize player B as much as possible?